Relationships among the three extant species of the family Cryptobranchidae. For more information about the extinct species, see Estes (1981). Salamanders of the family Cryptobranchidae are elongate (length may exceed 1.5 meters in the genus Andrias), dorsoventrally flattened, and permanently aquatic. 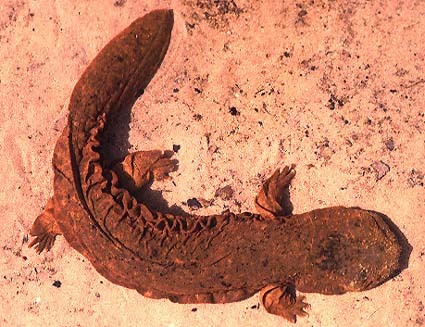 The genus Andrias contains the largest living salamanders, and fossil species attained even larger sizes, exceeding 2 meters in body length. Fleshy dermal folds are visible along the lower sides of the body in adults. Metamorphosis is partial; external gills are lost in adults but eyelids do not develop and the tail remains laterally compressed and finlike. Because the partially metamorphic adults of the family Cryptobranchidae resemble larvae of the related family Hynobiidae, cryptobranchids are considered to have been derived evolutionarily from hynobiid-like ancestors by retention of larval characteristics in adults (Duellman and Trueb, 1986). Cryptobranchids are generally found living in depressions under stones in streams and rivers. Andrias occurs in central China and Japan, whereas Cryptobranchus lives in eastern North America. Mating in Cryptobranchus occurs in late summer or early fall. Males prepare nests below large, submerged stones or logs. Females lay long, paired strings of several hundred eggs which are fertilized externally by the male. Males guard the eggs until they hatch in 2-3 months after laying. Although extant species occur only in Asia, fossils of Andrias are known from the Tertiary of Europe and North America (Estes, 1981). Fossils indicate that Cryptobranchus formerly occurred also in western North America. Asian salamanders of the genus Andrias are used for food and are now considered highly endangered. These large, aquatic salamanders have dorsoventrally flattened bodies except on the tail, which is laterally compressed and finlike. Limbs are short but massive and sturdy. Folds are present in the skin, which forms flaps along the lateral margins of the body. Eyes are small and lack eyelids. Larvae have caudal fins and short, external gills. They live under rocks on the bottoms of fast-flowing streams and rivers. The morphological characters given below are the ones standardly used to diagnose the salamander family Cryptobranchidae and to assess its phylogenetic relationships to other salamanders. The individual characteristics are in most cases shared with other salamanders and should not be interpreted as synapomorphies of the Cryptobranchidae. Absence of characteristics found in other salamanders is noted where it is important for distinguishing cryptobranchids from other salamanders and/or determining their relationships to other salamanders. These characteristics were assembled from a large number of original sources by Duellman and Trueb (1986), Larson (1991) and Larson and Dimmick (1993). Metamorphosis is incomplete in the Cryptobranchidae, leading to a number of paedomorphic characteristics in adults. Premaxilla consists of separated, paired bones. Bilaterally paired nasal bones each ossify from 2 anlagen, one positioned medially and the other laterally on the skull; the paired nasal bones abut each other, partially bisected by short posterior processes of the premaxillae. Maxillary bones are present and well developed. Septomaxillary bones are absent. Lacrimal bone is absent. Quadratojugal bone is absent. Pterygoid bones are present. Internal carotid foramina are absent from parasphenoid bones. The angular bone is separated from the mandible. Ear bones include a detached columella but no operculum. Replacement of vomerine teeth proceeds laterally in parallel to the maxillary teeth. Teeth have a distinct crown and pedicel. Origin of the levator mandibulae anterior superficialis muscle includes the exoccipital. Eyelids are absent. The first hypobranchial and first ceratobranchial (alternatively homologized as the first ceratobranchial and first epibranchial, respectively) exist as separate structures. The second ceratobranchial (alternatively homologized as the second epibranchial) comprises four elements. Larvae have four pairs of gill slits. Adults have one pair of gill slits (closed in Andrias). An ypsiloid cartilage is present. Bodies are dorsoventrally depressed and have fleshy dermal folds. The scapula and coracoid bones of the pectoral girdle are fused to form the scapulocoracoid. Vertebral centra are amphicoelous. Ribs are unicapitate. Neural arches of vertebrae lack foramina, and spinal nerves exit intervertebrally. The pubotibialis and puboischiotibialis muscles are fused together. Anterior glomeruli of the kidney are reduced or absent. Fertilization is external. Ciliated epithelium is present in the cloacal tube and/or anterior cloacal chamber of females. Epidermal lining is absent from the anterior cloacal chamber of females. Evaginations are absent from the dorsolateral walls of the male cloacal tube. Anterior ventral glands are present in the cloacae of females. No spermathecae are present in the female cloacal chamber. Glands secreting into the dorsal walls of the female cloaca are absent. Anterior ventral glands are present in male cloacae. Posterior ventral glands are absent from male cloacae. Kingsbury's glands are absent from male cloacae. Dorsal pelvic glands are absent in males. Lateral pelvic glands are absent in males. Glands secreting into the male cloacal orifice are absent. Parental care of eggs is by males. The diploid number of chromosomes is 60, 62 or 64 (Morescalchi, 1975). The salamander families Cryptobranchidae and Hynobiidae together form the suborder Cryptobranchoidea. Monophyly of the Cryptobranchoidea is supported by molecular evidence (Larson, 1991; Larson and Dimmick, 1993) and by two morphological synapomorphies (fusion of first ceratobranchial and first epibranchial; fusion of the pubotibialis and puboischiotibialis muscles; see Estes, 1981). The genus Andrias was formerly known as Megalobatrachus, and references to the former name are still common. The Cryptobranchidae is clearly a monophyletic group that is closely related to the Asian family Hynobiidae, as revealed by phylogenetic analysis of ribosomal RNA sequences (Larson, 1991; Larson and Dimmick, 1993) and morphological characters (Estes, 1981; Duellman and Trueb, 1986). These two families together form the sister taxon to the internally fertilizing salamanders, suborder Salamandroidea (Duellman and Trueb, 1986; Larson and Dimmick, 1993). The relationships shown for extant cryptobranchids follow biogeography and generic boundaries. Molecular phylogenetic studies including all extant cryptobranchid species have not been performed, however, so this grouping is somewhat tentative. David Heyse, Todd Jackman, Christopher Phillips and Eric Routman contributed to the preparation of this Tree of Life page.